Football recruiting is often akin to the careful planning of an investor. Coaches invest capital into players whom they feel will fill larger roles in the future. 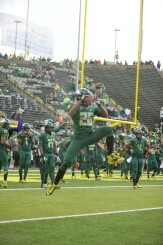 Oregon is no exception, as the Ducks are known for seeking youth and athleticism to fill gaps in their roster. 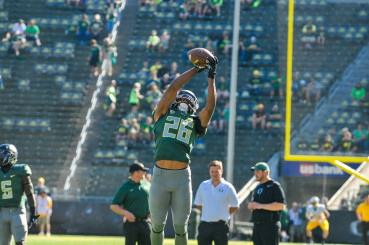 With the departure of several key defensive backs, freshman Khalil Oliver looks to show his value within the grand scheme of Oregon’s defense. Oliver was somewhat of an underdog coming out of high school. The Idaho native, who played under head football coach Scott Criner at Rocky Mountain High School, was rated only a 2-star safety by Rivals. Oliver’s track and field jumping ability allows him to disrupt passers. Standing 6’0″ and weighing 200 pounds, the athletic Oliver recorded 62 tackles and 7 sacks during his senior year of high school, earning an All-Idaho selection. Although his Grizzlies lost in the 5A state championship semifinals, Oliver’s efforts earned him recognition as the 5A Southern Idaho Conference Defensive Player of the Year. The versatile Oliver impressed recruiters with his athleticism, performing exceptionally as a high school track star. He specialized in the 110-meter hurdles, triple jump, and long jump, helping his Meridian, Idaho high school win a 5A state championship in 2013. Oliver’s explosive ability as a safety is matched only by his intelligence. The academic standout earned a 3.65 GPA in high school. Oliver has expressed an interest in medicine, specifically chemistry. His IQ benefits him as a defender, allowing him to recognize tendencies and diagnose opposing offensive schemes. Oliver spent his redshirt season learning from senior defensive ends. Oregon, Washington, and Boise State all expressed interest in signing Oliver. 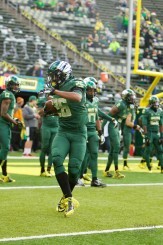 In February 2014, he committed to Oregon the same day as fellow safety Mattrell McGraw, a teammate he now clashes with for playing time in the defensive backfield. Oliver also expressed interest in competing for Oregon’s track and field team. However, things did not go entirely to plan; perhaps for the better. Head coach Mark Helfrich decided to redshirt Oliver midway through 2014, giving the defensive back an extra year to learn the position and to adjust to Pac-12 competition. In addition, Oliver aborted his plans to pursue track and field in Eugene. Oliver traveled with the team for much of last season. The departure of defensive backs Troy Hill and Ifo Ekpre-Olomu, in addition to Dargan, leaves the defensive backfield wide open for Oregon’s younger players. Oliver, McGraw, and sophomore Arrion Springs, among others, have been competing all spring for spots on the two-deep. Despite being a redshirt, Oliver traveled with the team for much of last year, culminating with his travel to Arlington, Texas for the College Football Playoff National Championship. He stood at the sidelines for the entirety of that loss. 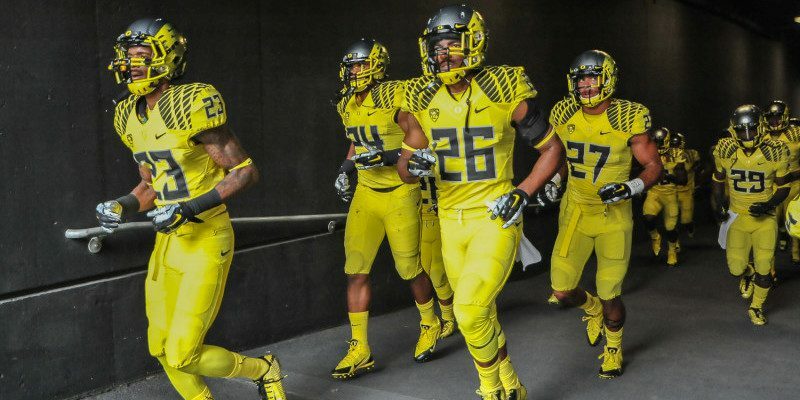 What was the end for many Oregon seniors marks the beginning of a potential standout career for the young Khalil Oliver. While it is unclear where he will end up on the depth chart, Oliver should be able to carve out a role within a position group that needs players to step up and fill spots. In any case, the future is bright for the young safety. With any luck, Oregon’s investment should pay off.